Those who don’t know anything about human embryonic stem cells, the name itself give some clues. As the cells are derived from Embryos, they are called embryonic cells. Usually they are collected from vitro fertilization procedure and not directly from woman’s body. Growing these cells in the artificial environment is a complex procedure. Now a days, most of the internationally popular laboratories are capable of growing cells in the artificial environments. Do you want to know how scientists are able to generate cells artificially? 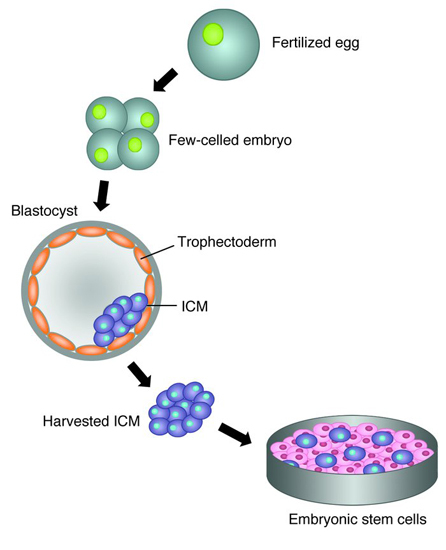 HESCs are developed from pre-implantation stage embryo. An environment filled with nutrient broth is created and it is popular as culture medium in the researcher groups. Earlier, the upper layer of the dish is coated with treated mouse embryonic skin. Later scientists found a way to replace it with more advanced system. This is a significant development as the usage of mouse skin can lead unwanted virus to grow in the culture medium. This embryonic layer is coated with nutrients so that the cells can grow rapidly. Though the process seems to be simple, it is so complex and even scientists face difficulties in developing a pre-implantation stage embryo all the time. Instead they opt for more efficient and economical method known as sub-culturing. Each time when the dish is filled with developed cells, medical researchers divide them and transfer them into another dish so that they can multiply and develop more. This procedure is known as passage. The advantage of this method is, this process can be stopped at any stage and the researchers can use them in their experiment. It is even possible to create thousands of embryonic stem cells in very short span through this procedure. Even doctors don’t know the 100% potential of these human stem cells. Everyone knows that they are very much helpful in knowing the complex procedures involved in the human cell development. Researchers are in the process of finding how these embryonic cells get converted into several organs. They are trying to control the development of organs so that in future they can develop defect less human organs. So, their usage is not confined to research institutes and laboratories. If the research yields positive results, even birth defects can be treated without any problems. Medical experts are in the opinion that even deadly diseases like cancer can also be treated if researches are progressed correctly. With the help of human Embryonic Stem Cells, genetic disorders can be reduced significantly. It is possible to replace to diseased cells which are derived in the form of heredity can be controlled by changing the PGD. By introducing prenatal genetic instead of genetic maladies, several heredity problems can be solved completely. Though the idea is yet to be proved, researches are in the opinion that it will surely yield positive results. Researchers are moving at a slow pace in this direction as the genetic mutation needs to be studied perfectly or else there will be many more problems. By 2009, only the first phase of clinical trials was completed and the results are extremely positive. In these trails, brain and spinal cord cells were replaced with new hESCs and the patients recovered quickly than normal. One must note here that the financial troubles involved in the research are stopping several researches to concentrate on this method. Though there is no significant research done on this way, dermatologists are in the opinion that the hESCs development can significantly help in curing the psoriasis completely. Now a days, people who are suffering from moderate or severe psoriasis are opting for biologic drugs. Biologic drugs are very expensive and in most of the cases, a psoriasis patient needs to spend close to $30,000 per year on the treatment itself. If hESCs come into picture, the treatment cost will get reduced substantially and the effects are also far better when compared to biologic treatment. How hESCs are helpful in psoriasis treatment? With hESCs, it is possible to replace the cells in the affected area with new cells. If the researchers are able to replace to skin cells with the new ones in the psoriasis affected regions, there are significantly better chances to control the disease as well to cure the disease completely. Psoriasis occurs because of excessive growth of skin cells and if the skin cell growth is controlled the problem gets solved. The methods used to stop embryonic cells growth can be helpful here. Researchers proved heredity connection in psoriasis occurrence. If one of the parents is suffering from psoriasis, there are 20% more chances of occurrence of psoriasis. If both the parents are suffering from psoriasis the chances increase to 70%. It is possible to reduce this percentage significantly by using hESCs. If one generation goes through this treatment, the changes of getting this (in case of future generations) skin disease reduce drastically. Unlike the regular treatment, where topical creams need to be applied daily, there is no need to follow a typical system if this treatment procedure becomes available. However there are several concerns in the medical circles over the use of hESCs in the treatment of not so complex diseases. After knowing the number of patients suffering from psoriasis, you will surely say that the researchers need to concentrate on usage of hESCs in the treatment of psoriasis. Most of the doctors express concerns over hESCs ability to form tumors. If they are not dealt with proper care, they can lead to cancers also. Even FDA expressed its concerns over this but no such side effects were observed in the initial clinical tests conducted by FDA. According to researches, hESCs procedure is far better when compared to IPS cells. To promote the use of cell replacement therapies, doctor groups support also needed and it is the responsibility of the researchers to clarify the doubts raised by doctors, so that they will prescribe this procedure to more patients.